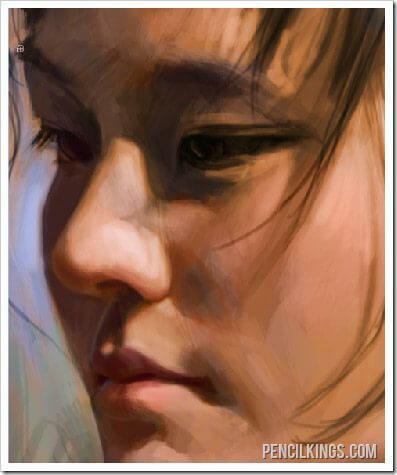 Here’s a look at the detail in the eyes that you will have at the end of this lesson on painting a realistic portrait. 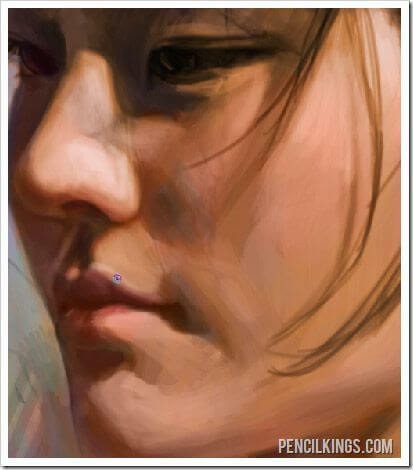 For the next part of this tutorial on painting a realistic portrait, we’re going to look at color values. 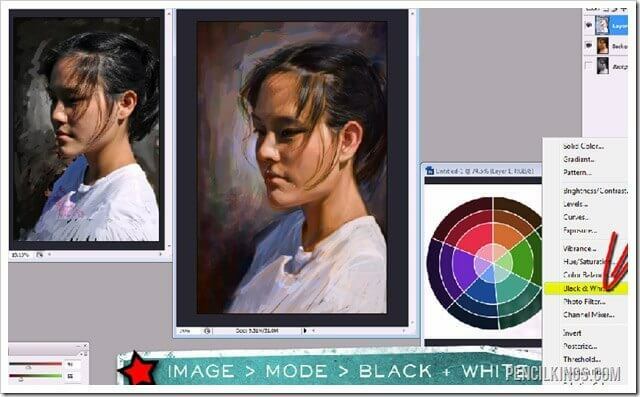 First, create a Black and White adjustment layer above the color layer so that you can quickly turn it on and off to check the values in your painting. If you’re new to Photoshop: You can read up on adjustment layers in the Photoshop Help, but to put it simply, an adjustment layer is a layer that affects all of the layers under it and gives you easy to use controls that will control how the image looks. 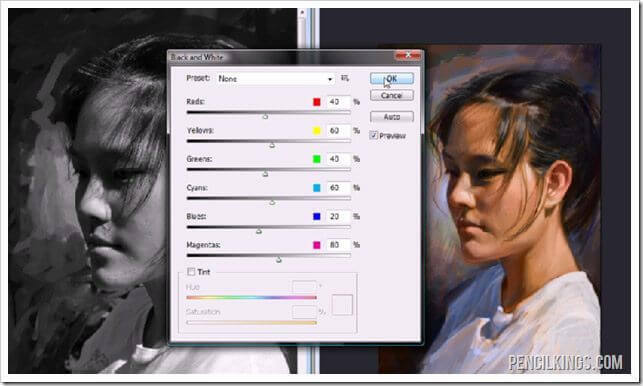 You should also add another Black and White Adjustment layer to the reference image so you can check the values there as well and make sure that they are matching. This image shows the options for the Adjustment Layer. You shouldn’t need to adjust any of these settings – they will automatically give you the black and white image that you need to quickly check the values. 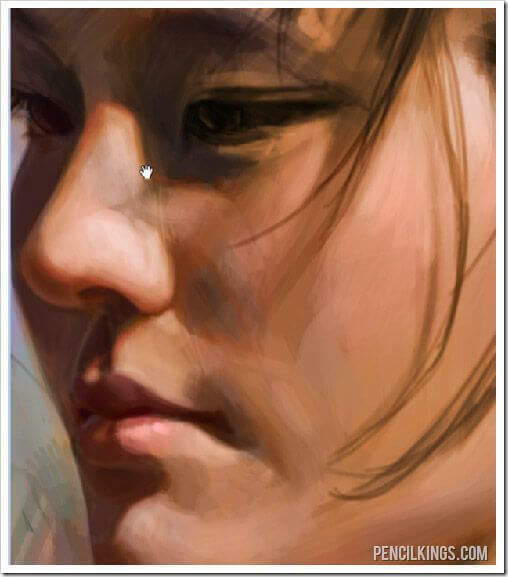 Start off the next part of this tutorial on painting a realistic portrait by creating a new layer that will sit on top of your color layer that you have been working on. Previously you were using the “Color” blend mode, but for this new layer you can leave the blending mode set to the default of ‘Normal’. 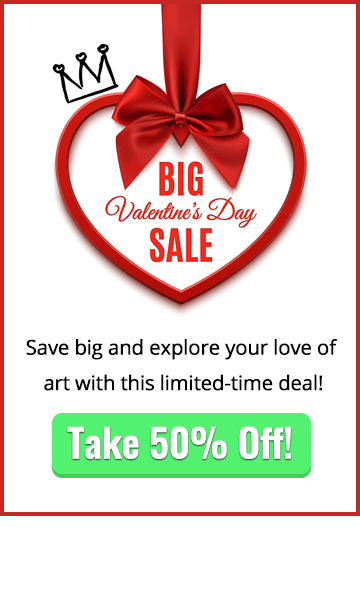 Because all of the colors you have been laying down are harmonious with the color palette, you can select your colors right from the canvas and adjust them slightly as needed with the color slider to get your desired color. Note that small color adjustments are ok, but if you change them too much you are risking losing the color harmony of your image. 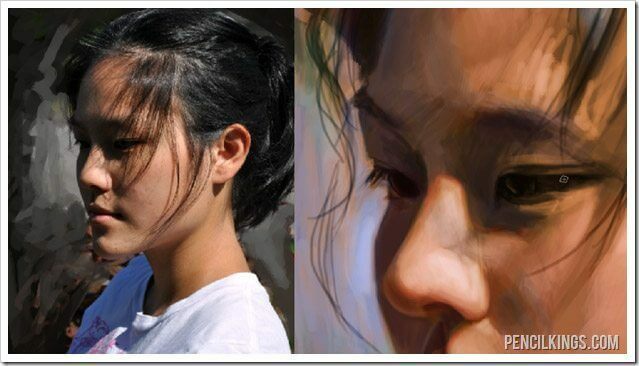 Lips need to be given special consideration when you’re learning about painting a realistic portrait, so keep the colors soft. It’s easy to choose colors that are too dark, or too intense for the lips. You can see in this example image that there is a subtle highlight on the upper lip as the form of the skin angles out more and catches the light ever so slightly. Where the lit area of the face meets the shadow the line that defines the two areas will have more saturation to it than the surrounding areas. You can think of saturation as the amount of ‘color’ that is in a color. That sentence may sound confusing, but if you consider a colors like white, grey, and black – these ‘colors’ have no color information in them. You can illustrate how saturation works with the Image > Adjustments > Hue/Saturation tool in Photoshop and play with the values for Saturation. In the image to the right, you can see a clear example of this below the nose. Notice the edge of the shadow – can you see the orange tint to it right where the light and dark parts meet? Another way to think about saturation is with traditional tubes of paint. You have one which is a medium grey (exactly half white, half black), and you have another tube of paint that is the brightest yellow you can find. The grey would have no saturation, because there is no color, only black and white. The yellow would have 100% saturation, because it is the brightest yellow and full of color. Now, if you mix the two, the saturation, or colorfulness, of the yellow is naturally going to decrease, and because the grey was 0% saturation, and the yellow was 100%, mixing the two of them will give you a new greyish-yellow color that has 50% saturation. 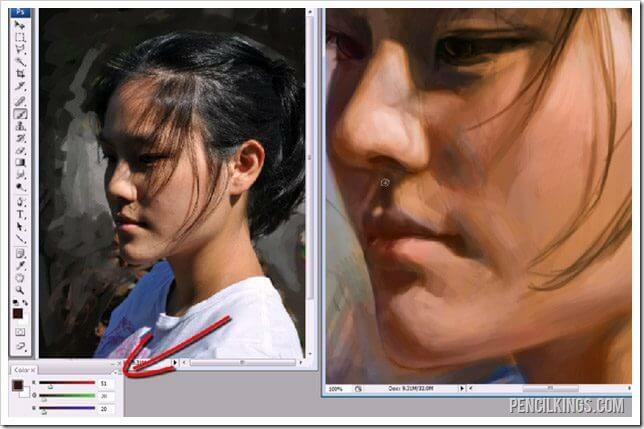 We hope you learned a lot about painting a realistic portrait from this article. 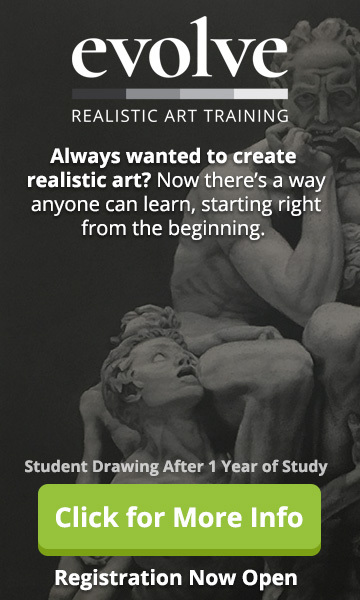 See you in the next tutorial! 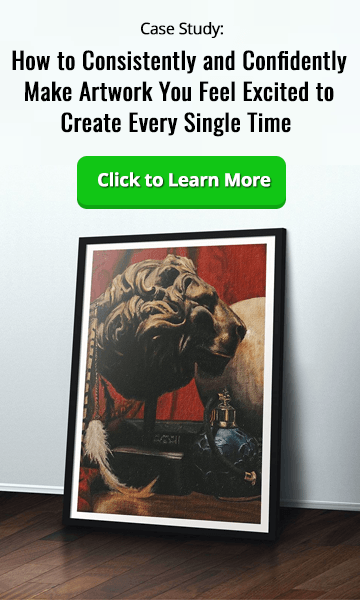 In Sycra’s opinion a painting should always look better than a photo, because the artist has had an opportunity to play with the image and bring his or her own interpretation to the image. This is an important concept to grasp, because it frees you from the feeling that you are just copying a photo, and gives you room to play, be creative and explore.